really helpful guide! some ideas I haven’t seen before for christmas, I think my kids would love the National Geographic Break Open 10 Geodes ! Actually I would like to do that too, that looks like a lot of fun! Great ideas — I’m still shopping for the kids! Thanks for all the great ideas! I need help with shopping!! These look like awesome gifts for the kids for Christmas. I love your Kids Gift Guide! It’s spot on to most of the items on my children’s lists! I think my daughter would love the National Geographic Break Open 10 Geodes! Thanks for all the great gift ideas! My grandkids would love the National Geographic Crystals, rocks and minerals set. I could really use the gift card for them this Christmas! Thanks! I would love to try some Nerium products! I could pamper my skin! Thank you for this gift guide! Very helpful and i love how much detail you included with each product! Thank you! I have 2 kids still on my list, and love all the gift ideas. Great reviews, helps a little for my grandchildren. Great educational products. Love National Geographic! I love the National Geographic Crystals, Rocks and Minerals Science Kit! My 3three Nieces would love that kit!. I really think I will buy that for them this weekend! I like a lot of the ideas! The Wolverine Slippers look amazing. They look so soft, yet durable. A great gift for my husband. I really love the Helen Ficalora charms! Great selection of gift ideas. Nice list of gifts. Some I had not thought of. I am thinking about buying the National Geographic. Learning gifts are awesome! These are all really great gift ideas! A lot of them I wouldn’t have thought of on my own. Thanks! Nice! Love everything in the guide! I love educational gifts for children. The fairytale spray really works! We had no lice after using that and keeping the girls hair in pony tails. Men are definitely the hardest to shop for, in my opinion! But I like the look and the idea of those nice slippers! Great ideas. Science kits are always fun to give and get. These are great ideas . I love these ideas- I have a 6 year old niece and I’m having a hard time! Cool! You have great eyebrows. I considered both of those National Geographic sets for one of my grandsons. Heck, I wouldn’t mind having the crystal growing set myself, one of my favorite things to do as a kid. My son would like the National Geographic kit. I love Wolverine and National Geographic Break Open 10 Geodes ideas, thank you! Cute gifts! Who wouldn’t like them?! I love the reviews! Happy holidays! Some really nice gift ideas, I especially like the National Geographic Break Open 10 Geodes it’s interactive and also really pretty too. Thank you for the chance to win this. This would be a great blessing. Thanks again and Merry Christmas!! Thank you for this great guide and giveaway! Always see some great ideas for gifts on blogs. National Geographic Break Open 10 Geodes would be perfect for the Grandchildren. Crystal rocks and minerals…great gift idea. You gave me some very good ideas for shopping. I’ll be shopping this weekend, Thank you! These are some amazing ideas! I really love the Helen Ficalora charms. I didn’t even think of those, and they would be amazing gifts! Great gifts ideas. Thank you for the giveaway! I love the idea of the Helen Ficalora charms. Seems like something I would like! I love that they have gifts for both men and women. Nerium International’s products look lovely and perfect for me. its always nice to have a great gift guide. There always ends up being one person that you have no clue what to buy them. This is an awesome opportunity for all kids. Thank you for the amazing opportunity and Merry Christmas to you and yours! Thanks for the gift ideas. And Thanks for the terrific giveaway and the chance to win Merry Christmas. Turkish Extra Virgin Olive Oil is my favorite on your gift guide. I love all the Holiday gift ideas,….especially the Crystals,Rocks, and Minerals and all the learning gifts for my Granddaughters….yep all girls. 5 Granddaughters. The Men and Women gift guide has some great ideas too. American Express Gift card would be really helpful since I am between jobs and helping my daughter care for her newborn baby. The Lodge moc slippers sound cozy. Thanks for the gift guide and a chance to win! I like both of the National Geographic Sets. I really like the Playbrites. My kid would love it. Interesting gift ideas, happy holidays! I concur on all the great gift ideas. My grandsons & GREAT nephews would love the crystal rocks and minerals so they could make me some beautiful Gems. My kids would love Chippies by WowWee. So fun! You have some great, and unique, gift ideas. Thanks for the great gift guide! The National Geographic Geodes look like something even adults would love. The crystal kit is fascinating! I know my children would like that! Great guides. The wolverine Lodge Moc Slipper would be a huge hit. The Chippies by WowWee is darling and something any child would love. My daughter would love the playbrites or the robot puppies! So cute and such original gifts! I love the Helen Ficalora charms. I love your gift guide! It really is a fun one and I like the Playbrites and the Helen Ficalora charms. My son would love the crystals and stick bots.These are great gift ideas. When I was a kid I would of loved the Crystal, and rocks, and mineral gift. Your site has given me some amazing ideas for gift. Thanks! Great gift ideas my grandson would love the gem rocks thanks for a chance to help with my shopping . I love the Playbrites – I think my grandson would love this. Thanks for the idea! Thanks for sharing a great list. I like the Helen Ficalora charms! These are all wonderful gift ideas! My daughter would like the crystals set. Love the national geographic kits you included. That National Geographic Science Kit would make a good gift for a kid I know. Great ideas. Thanks so much! The Wolverine Moc slipper sound great. I love the Wolverine brand. I think these would be great for my Dad. The National Geographic Geodes are great gifts for kids. My kids have enjoyed breaking them open and seeing whats inside. Its learning, but in a few way. Thanks for the great gift guides. My boys would love the National Geographic set, they really enjoy the books they have for kids too. Very educational for kids of every age! My mom would love to get my nephew the rocks and minerals kit! She would love to introduce him to rocks and minerals!!!! Heck, my husband would love the geode kit. Thanks for the chance!!! The Crystals Kit–in fact, my husband and I may have more fun doing this than my son! This is a great list. One of my favorite ideas is the National Geographic Crystals, Rocks and Minerals Science Kit! I saw the Stikbots at Michael’s the other day – what a fun idea! I’d pick one up as a gift if I had a kid. THE LINHART SUBSCRIPTION BOX WOULD BE AN AMAZING GIFT FOR MY LOVING HUSBAND, AS HE HAS HAD MAJOR TOOTH DISCOLORATION SINCE HE WAS A KID. HE HAS ALWAYS BEEN REALLY CONCERNED ABOUT THE WAY HIS TEETH LOOK AND AVOIDS SMILING MOST OF THE TIME. HE DESERVES A CHANCE TO EXPRESS HIS JOY IN EVERYTHING! I picked up the Stikbots for my son for Christmas! This looks so cool! I’ve been finding so many great gift ideas on various gift guides. I see several here I need to check out further. Lots of great ideas, like the rocks & crystals. I like these gift guides. The Chippies by WowWee is on my daughters wish list this year. These are all great gift ideas. I especially like the Playbrites for the grand kids. Many interesting ideas for Christmas gifts, fun too! They’re all perfect especially the necklace. My granddaughter would love the Crystals Kit. This is a very helpful list. I like the educational toys for kids. The geodes are pretty cool, they fascinated me as a kid. One of my littles collects rocks so she would love that. thankfully i’m mostly done shopping but this would help cover the last bit, thanks for the chance and Merry Christmas! Great gift guide. I still have a few more gifts to get. Thanks for these unique ideas I have never heard of most of the stuff on this list. We had something similar to the National Geographic Crystals, Rocks and Minerals Science Kit when I was a child. It was a rock tumbler & we had many hours of fun playing with it. I love gift guides. I have such a hard time as my kitchen as are getting older. They ask for things, but I like to throw a surprise in the mix. My kids love geodes, that would be a great gift. Most unique, Hope I win. Totally love the rocks and crystals kit. I’ve always loved rocks, and this is perfect to share that love with my nieces and nephews. I didn’t know Wolverine made slippers! On my way to get my son a great gift! Love the gift ideas. Thanks for the giveaway. The Helen Ficalora charms would be a great gift to give my mom. I have actually finished my toy shopping but smooshy mushy has me teetering on grabbing one. Those are adorable. Wonderful gift ideas..thank you for sharing! Thank you for this gift guide! It will be really helpful when shopping for my nephew! I have so much last minute shopping to do, so this is really helpful to read. Thanks! I especially like the National Geo science kit. It would make a great giftie! This would help so much with the holidays being near!! This is a great gift guide with some wonderful ideas. I would so love to win this one sure could use it this year thank you for sharing. What a great gift guide! My son would love the science kits! I just bought him a crystal growing kit for Christmas. I love that necklace! I’ve seen several versions of “Mother” jewelry, but I feel like this is probably one of the more elegant ones. Thanks for the giveaway! The STEM gifts all look great! What a great gift guide! I love the Playbrites and my husband would love the HİÇ Turkish extra virgin olive oil! Thank you for sharing this and for the awesome giveaway opportunity! so many people need cash this year, thanks for giving us the chance to win some! I would love to try a recipe using the Turkish Extra Virgin Olive Oil. Thank you for the opportunity and Merry Christmas to all! Great guide. And I know the Crystals set would be a big hit! Thank you for the wonderful gift ideas. The National Geographic Crystals, Rocks and Minerals Science Kit, we’re outdoorsy. I could use the Nerium International anti-aging skin products! Lots of great gifts to choose from. The chippies by Wowwee sound fun! This gift guide is so helpful! These are great gift ideas for kids!! I think my grandsons would love to have a Playbrites! How neat! Thanks for all the gift ideas. The card would be nice for some of them. Love all the gift ideas! My daughter would love the National Geographic Crystals Science Kit! This past summer we went to local caverns. She very much enjoyed that! These are some really excellent gift ideas! Thank you for the ideas! Still shopping for a lot of people~! I love the Helen Ficalora charms. I also think my grands would love the robotic puppy. Love this gift guide. We got that National Geographic Geode kit in our last Amazon STEM box. I hadn’t heard of the Playbrites before! This could help me out during the holidays. I love this gift guide! Thanks!! Cute ideas for the kiddos. kids need toys and I aint got no job. Bye Felicia! I like the Olive Oil. I have a friend who is really into cooking and he is big on olive oil so it would be a great gift. He explained (more than I wanted to know) all the types, origins, etc. Great gift ideas! I still have some shopping to do. Great gift ideas! My favorite is the Helen Ficalora charms. The crystals kit. I would not mind that, myself. Love educational things. Great gift guide and great prize. Thanks. All are pretty awesome gifts. I know my granddaughter would just love the chippies. Great gift ideas; I always appreciate educational options. Our whole family loves science (nature, stars, rocks, animals, weather) so would purchase some kits. Thanks for the opportunity! You have some neat products! I like the National Geographic Geodes, they would be fun to break open and pretty to have. The Wolverine workboots would be great for my husband. Happy Holidays. The crystal kit would be the perfect gift. That’s what he’s been askin Thank youg for! My kids love to dig for gemstones! That’s the gift that I would choose for them! Some great ideas, a few of them are new to me! Oh no! I see more gifts to buy. I should be done, but it is so fun to find gifts I know someone would enjoy. The crystal rock kit is pretty cool – I might want it myself! Still shopping for friends and family. This would be great! Thank you. i love all the gift ideas you provided in this post and I especially loved the National Geographic Crystals, Rocks and Minerals Science Kit that i am sure my boys will love receiving for Christmas this year. There are so many gifts so this makes shopping even easier for me being a mother of three! Greetings from Texas! So many awesome gift ideas! My girls would love the crystals but my son would like the playbrites!! This is really great ideas for the hard to shop for person!! My daughter would love that rocks and crystals kit. She is sooo into that stuff! Great gift ideas for the kids! Glad to see some educational yet fun gifts on this list. And my nephew would love the lamp! Playbrites would definitely be the number one pick for my daughter. My daughter would love that rock kit! Wolverine is a really good boot, my guy would love this brand for Christmas. So many wonderful gifts!!! Love those Playbrites!! Thanks for the neat gift ideas! My 7 year old would love both of the Nat Geo kits! And I love all of the ideas for women! I would love to receive a Helen Ficalora charm, or any other. So nice. Great ideas for guys – they’re so hard to shop for! Thank you for the gift guide – I haven’t heard of most of these gifts before. The Chippies, look like so much fun; my grandson will love it. The Playbrites seem cool. I think my daughter would love to have these in her room. I would love to win this gift card for my niece! So I can buy her some great Christmas presents! This is a great Gift Guide. Thanks for all the ideas. I would have loved those geodes as a kid. I’d like to have the National Geographic Crystals, Rocks and Minerals Science Kit, I think they would be fun to do with my kids while teaching us all something. 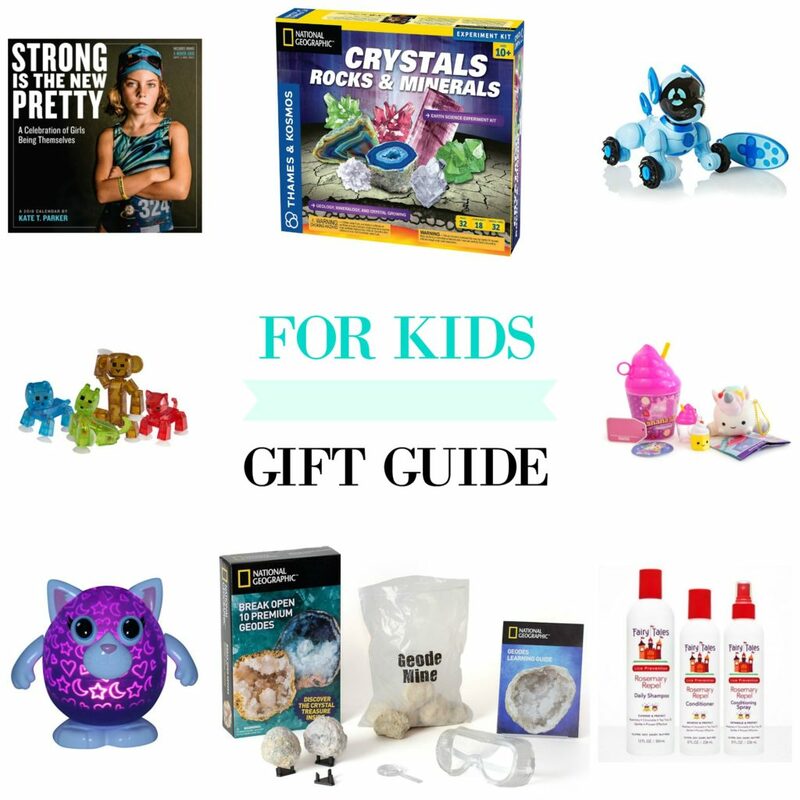 Great gift guide.The Geodes are always a hit with my kids. They keep them entertained and they have fun breaking them open. Those robot puppies are so cute! And the crystals and geodes are pretty too. These would all make great gifts. My two girls would like the geodes kit. They are fascinated by opening geodes to discover the hidden surprises! I love your Holiday Gift Guide for kids. You picked some fantastic choices for toys! Thanks for all the great gift ideas! My hubby would love those Wolverine boots and I would a Personalized charm from Helen Ficalora! The linhart subscription box is not something I have heard of, I think it would make a cool gift. So many great gift ideas! Thanks so much! These gift ideas are great!!! Thanks! Some wonderful ideas. Thanks for putting the list together for us! Still struggling with thinking of gift ideas, this helped a ton! I like the National Geographic kit, though my grandson is still a bit young. His mother would like the necklace though. This would be such a blessing if we won because we are so broke and almost homeless. I have a boy and twin girls. My son has always loved science and math. He is currently in college and his major is Biology. My twins are still in high school. I have always encouraged all of my children to pursue science and math. One of the twins expressed an interest in being a pediatrician when she was in kindergarten. The other decided in middle school she is going to be an anesthesiologist. The Chippies are very cute. Great for an adult too. I ordered playbrights for both of my girls after reading this post. My girls love having night lights and unicorn that we bought is going to put a huge smile on my little one’s face. These are some great ideas. Cool gift guide! I love the geodes! These are some great gift ideas. Thanks for your reviews. The National Geographic crystal set looks very cool! I wouldn’t mind getting that myself lol that’s a neat set to give to a kid into geology for sure! Thanks for the giveaway! I would love to try the Crystals kit. I think my granddaughter would enjoy that. Thanks for the gift guide. Perfect stuff for the grandkids. Now, what about a gift for my wife? A perfect gift for my friend for Xmas! The rocks would make a terrific gift! My 7 year old son would like the Playbrites for his room.. Thanks for this contest and have a great holiday season! My kids would love the robot puppy. My grandkids would love the National Geographic crystals, rocks and minerals, as would my daughter. My kids would like the Chippies by Wowwee. Thank you for your thoughtful gift ideas. I have two more folks on my shopping list and then I am done for the season. Can use the money for Christmas. Just ask the daughter. Nice guide-I always have trouble picking gifts. Great Giveaway Guide! Can’t believe its almost here! Thanks for having this giveaway! I love the “Strong is the new pretty” calendar! As a Mom of four adult children and grandmother to three kids under the age of 7, I’m thrilled to have help with shopping (either by gift ideas or $$$) Thanks! I’d love to try the Turkish Extra Virgin Olive Oil, it is hard to find a good authentic olive oil. My girl needs a night light that isnt a plug in!! Thanks for the gift guide! Love the crystal one. This would enable the gift of books for Christmas. Some really nice ideas in this post! Thanks! I would love The Nerium Products for my friend,she needs some pampering! Thanks for all the gifting ideas! Awesome gifts and my youngest would love all of those adorable animal from playbrites ! Olive oil is a wonderful gift idea! When my kids are older I wan to get them a crystal kit. Those are so cool. I WOULD LOVE TO WIN THIS GIFT CARD TO HELP WITH CHRISTMAS DINNER. MONEY IS TIGHT AND THANK YOU FOR THIS CHANCE. I would love to have some of the Nerium International skin care products. I am sure my 28 year old son would love to have the lodge slippers because they look warm, cozy and comfortable. My nephew would love the National Geographic Crystals, Rocks and Minerals Science Kit. He loves science. He is going to be a STEM kid for sure! Thank you for the great gift ideas and the giveaway! Great giveaway-thanks for the chance. My husband would love the Wolverine boots. The Nat Geo Rocks, Crystals and Minerals kit would be a huge hit for my wanna be a scientist 7 yr old. Great list of ideas! Fun gift ideas. I like the Crystals and Rocks one the best! Stikbots because my niece loves to make videos. I love these gift guides! My favorite is the National Geographic Geode Kit my niece would Love it! A lot of different great ideas. Great gift ideas for my 10 year old that don’t involve a screen! This is awesome list of suggestions. I really like the skincare idea! I’ll have to check these products out. Thanks for the giveaway! Some fantastic gift ideas here, thanks! I’ve wanted to try Nerium products. I’ve heard good things about them. I would love one of the Playbrites for my little girl. Crystals would be a big hit. My nephew would love the National Geographic Crystals, Rocks and Minerals Science Kit! He is really interested in science. I love all these ideas for holiday gifts. There’s something for everyone! I think my mom would really like the Helen Ficalora charms with my sister’s and my birth stones. Great gift guide- I love the science kit! I would love a Helen Ficalora necklace with my children’s names. I like it so much better than a lot of the other family jewelry out there. I have to say my husband did a great job 20 years ago with my mother’s ring though. Thanks for the great gift guide! my son would really like the Rocks and Minerals gift! Thank you so much for the gift ideas! I’m having a hard time shopping for my little sister and this game me some wonderful ideas! So many great gift ideas. The smooshy mushy is awesome. Also the geodes for the family would be great. I would love to get my girls each a Workman publishing calander to help them keep their schedules on track! Would be a great benefit to them! Tysm for sharing! The National Geographic Crystals, Rocks and Minerals Science Kit is such an awesome idea! My boys would love it, I’ll have to try to track one down before Christmas. The crystals look really fun! I think my daughter would love the Smooshy Mushy. She has all sorts of different things like this that she is constantly playing with. Thanks for the ideas for children and Happy Holidays to you and your family. The skincare line by Nerium International sounds really good. I hit 40 this year and I plan on FINALLY starting a skin care routine for 2018 (it is LONG over due!). I also like some of the toys you suggested…since I already bought xmas gifts, I am definitely going to keep your ideas in mind for upcoming birthdays! Thanks! This would come in handy this holiday season, so many people to shop for. I like the National Geographic geodes gift idea. Thanks. I like all the ideas for gifts!!!!!!!!!! The crystal box is cool and good for kids and adults. My kids would love the geodes. They love cracking those open! I think the playbrites and Smooshy Mushy toys would be fun for my daughter. I enjoyed reading your recommendations. My daughter would enjoy the crystals kit. 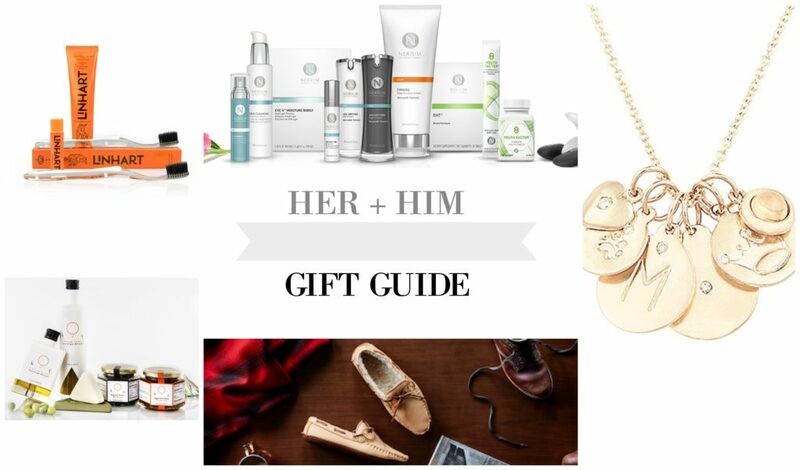 What a great gift guide – I love the necklaces! Those are really great gift ideas! Many that I would never have thought about so this is very helpful. These gifts look great, I’d love to give or receive any of them. Thanks for the great gift ideas. And if I win the gift card – I’ve got it earmarked for a post-holiday gift for myself. My nephew loves National Geographic items — he has learned a lot from them. Happy Holidays! Wow, this guide really helped give me ideas for last minute gifts for the family. Fantastic! This guide is so helpful! I love the focus on STEM gifts. I love to look at gift guides. They are really nice because they give you some helpful ideas on gifts that can be given to the family. I loved Geode’s as a child. Such great gift ideas. I’m done with Christmas shopping but I always have birthdays to shop for! I want to wish you a merry Christmas. You too! And thank you! Very nice gifts, especially the National Geographic Crystals, Rocks and Minerals Science Kit. I have always given education gifts to the kids in the family. It is a good way to show children that learning can be fun. I think my niece would like the Geodes. Wow, thank you for this guide… great gift ideas! O love the gift guides since I am totally out of ideas for loved ones! My nephews would love the crystals and my niece would love the charms! What a great gift guide!! I’ve had my eye on Helen Ficalora jewelry for a while, and the Hiç Extra Virgin Olive Oil looks like something I’d love in my kitchen! great guide; it has lots of things i wouldn’t think of getting. I think the geodes look like a gift my kiddos would love. My niece and nephew would love the rocks and minerals kit. Great for the holiday break. You’ve shared some great products, but my husband could use some good-quality slippers. so I am really liking the Wolverine brand ones for him. The smooshy mushy looks like fun! Best prize of all, thanks for the chance! I was looking for a cool gift for my nine year old nephew. I saw Stikbots on almost every list I googled. I bought him 4 packs to get him going. Looked on youtube to see what others are doing to show him how cool it is. I haven’t bought anything for myself this Christmas, the skin care products mentioned above sound ideal, would be nice to pamper myself a little. There are some cool gifts in the gift guide. We would love to have the crystal growing kit. We would love the crystals kit. My grandchildren would have lots of fun with the NatGeo kits! These are nice gifts, my favorite is the National Geographic Break Open 10 Geodes! The Wolverine boots look really nice and comfortable to wear. It’s wonderful to have a reliable pair of boots in the winter for shoveling snow. My niece (and other school age kids) need the fairy tales hair care line. Thank you for this awesome guide and giveaway!! Love your blog. I love that you have Helen Ficalora listed on the gift guide. I love their products. Great quality and designs are so beautiful. Thanks and happy holidays! Great gift guides! I definitely need them when shopping for men! My boy would love that rock and mineral set. Thanks for the chance and happy Hoildays. This would really help out but more important it would get the New Year started out right. Very nice ideas for the kids. I would love to get the Science kit for my sons class to try! Thanks for the chance and Merry Christmas! I loved the playbritex. Merry Christmas! My niece would love the National Geographic Crystals, Rocks and Minerals Science Kit. I think the National Geographic Crystals, Rocks, and Minerals Science Kit would make a great gift for my six year old granddaughter who loves science! Love the thought of Wolverine Moccs! Love all the great gift ideas. My wife loves the Helen Ficalora charms. I think my favorite item on your gift guide is the Helen Ficalora charms.Thanks for the chance to win the gift card. Have a terrific weekend. Happy Holidays! I can think of many things to buy with the Amex Card.